This is one of the greatest attractions in Gangtok and should not be missed. It's a double-cable zig back ropeway which is operational since December 2003. 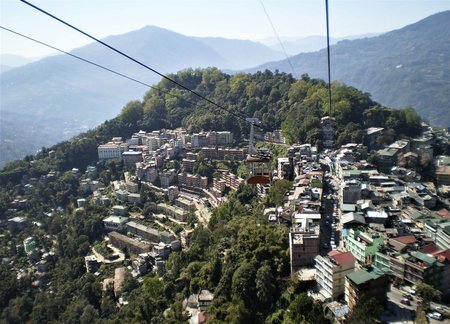 Each cable car can carry up to 24 passengers. They do not always wait until the cable car is full. But during high tourist season, there are usually long queues and each ride gets full before it starts. And if it gets full, you will struggle to get a vantage point inside the cable car unless you are one of the first to get in. There are three stations in this 1km long ride (up and down is 2kms). The lowest station is at Deorali near Institute of Tibetology. From the road a stairway leads up to the ticket counter. You will then come to the waiting room at the same level, await your turn and then take an elevator to the cable car station about 100ft above. There are no seats in the cable car, so you need to stand. The next station is Namnang and the top most station is in Tashiling next to the Secretariat. You can get off anywhere. But I would recommend that you take 2-way ride ... the ticket price includes two-way ride and you get awesome views both ways. One way ride takes about 10 minutes. So what can you see from the ropeway? The whole of Gangtok township and if you look down below where you started, you will see the Deorali bazaar. You can also get amazing views of Kanchenjunga snow peaks and the valleys. Look down and you can see a river flowing some 3500 feet below. Overall an unforgettable experience. 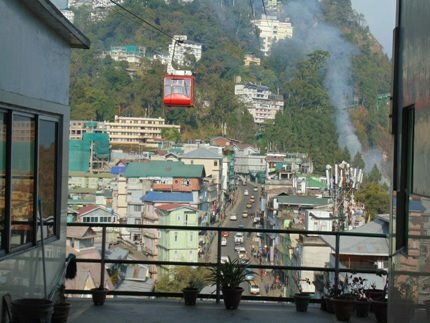 If you plan to take good pictures from the cable car, then grab one of the end positions in the cable car - preferably the end facing downward so that you get the best possible view of Gangtok township. You will find a small glass pane on either side which you can slide and take unobstructed picture through that. If you are taking a round trip from Daorali, just don't disembark. At the Tashiling station the cable car will start its reverse journey and this is when you get the best view of the valley below and that of Gangtok. You will also see another cable car passing yours midway in the other direction. At the end of the trip when you get off at Deorali station, instead of the elevator for exit, you will be asked to take the stairway to go down. Midway down the stairway, you will find a mid-scale restaurant where you can take coffee or even lunch. The Cable car operates daily between 9:30am to 4:30pm continuously. Ticket price is Rs. 110/- per adult and Rs. 70/- for child below 6 years (free below 3). Video camera charge is additional Rs. 100/-.